“We were delighted to be able to expose the Bell 505 to our customers and industry partners, and the helicopter was extremely well received by everybody who attended,” said Gary Phillips, NAC’s Executive Director, Helicopter Division. “The spacious cabin and advanced systems were the features which seemed to attract the most comments. We look forward to seeing many more in the Southern African skies in the near future,” he added. “The Bell 505 Jet Ranger X continues its international success story and has been exceeding customer expectations,” said Sameer Rehman, Bell, Managing Director for the Middle East and Africa. “Bell has a long standing history in South Africa through our embedded support network and we are excited to build on our legacy by bringing this new aircraft to market. 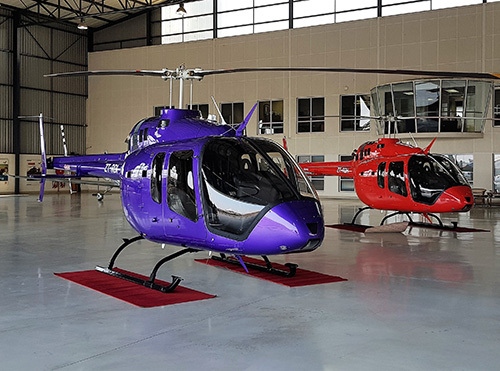 South Africa is a key market for light helicopters and the Bell 505 is perfectly suited to support the growth of general aviation and the parapublic sector,” Rehman continued. As one of Bell’s most in demand commercial aircraft in the world, the five-seater was designed through customer collaboration to ensure both pilot and passenger receive a safe, smooth and enjoyable experience. To guarantee efficient and reliable performance, the design consists of proven dynamic components, advanced aerodynamic design, a dual channel FADEC Turbomeca Arrius 2R engine and best-in-class value.